However you look at it, digital business is big business. 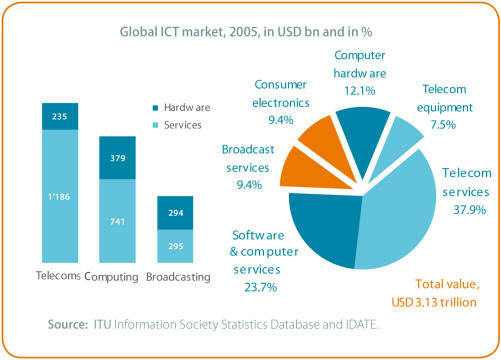 The clearest evidence for this is at the macro-economic level, where the contribution of ICTs to the general economy has grown rapidly, regardless of falling prices. In 2004, telecommunication services contributed some 3.3 per cent of Gross Domestic Product (GDP) worldwide, compared with just 1.8 per cent in 1990, with virtually every single world economy enjoying growth. On the mobile side, the exorbitant prices paid for 3G licenses, which seemed extortionate after the collapse of the IT bubble, now seem more reasonable, particularly given the ongoing expansion of the mobile sector to reach 2.17 billion subscribers at the end of 2005. Of these subscribers, just over ten per cent have already shifted to third generation mobile systems (3G). The reality is that, despite the severity of the crash that affected the technology sector between 2000 and 2003, the underlying networks have simply kept growing with barely a hiccup. Key factors driving growth include higher-capacity, user-friendly services and a shift to flat-rate billing models. In the mobile broadband market, Japan and the Republic of Korea were early leaders, but Italy and the United Kingdom are catching up fast. However, mobile broadband suffers from the same limitations as fixed-line broadband, when it was first introduced at the turn of the millennium. In many cases, it is complex to use and the quality of service (e.g. for viewing video clips) is sometimes poor, due to capacity constraints, and prices remain high. However, the problems of capacity, quality and price should be resolved as W-CDMA networks shift to HSDPA and CDMA 2000 1x networks are upgraded to EV-DV and EV-DO. The development of fixed wireless services, such as WiMAX, and the use of dualmode handsets and data cards will increasingly blur differences between different platforms. Ultimately, the goal is to deliver access to consumers more cheaply and conveniently. Improving technical capabilities of mobile networks will help increase the overall range of delivery platforms available to consumers. As platforms diversify, inter-modal competition will become more important. Those economies that have historically shown the fastest growth in broadband are those in which end-users have the most choice, for instance between DSL, cable modems, fibre to the home, and now 3G mobile broadband as well. The requirements of end-users are increasingly at the forefront, as businesses place greater emphasis on understanding demand, particularly in saturated markets. In this respect, the growing trend towards the personalization of services and user-generated value is having a significant impact on re-shaping the industry. First of all, end-users are generating a higher share of networks investment than in the past, as more and more equipment is now owned directly by end-users (e.g. broadband routers). Second, a higher percentage of revenue now derives from subscription charges and advertising, than from usage charges. Markets are also increasingly global, with a greater share of both revenue and innovation coming from outside the home market of service providers. Finally, competition between different technology platforms is now just as significant as competition within the same market. All of these factors have an impact on business, but also on policy formulation, which requires a much more integrated approach, and less reliance on traditional sector-specific regulation. You can download the full chapter three: business.digital now!